Tripp Lite's OMNIVSINT1000 line interactive UPS system offers voltage regulation, surge suppression and long lasting battery support for personal computers, internetworking equipment and other sensitive electronics. Internal UPS circuits support entry level PC systems for up to 60 minutes during power failures so that connected equipment can be shut down without data loss. Automatic Voltage Regulation (AVR) circuits regulate brownouts as low as 159 volts back to usable levels without using battery power. Offers complete desktop power protection in an attractive black tower configuration. Includes 6 outlets with battery support and AC surge suppression. USB port enables optional unattended system shutdown without data loss in the case of extended power failure, USB cable included. Built-in single line RJ phone surge suppression jacks protect modem, fax machine, cordless phone or other peripheral with a standard dialup/DSL phone connection. Built-in audible alarm and 4 front panel LEDs indicate line power status, battery power status, battery low/replace status and load status. 1000VA power handling ability supports entry-level PCs, network workstations, point-of-sale equipment, small business phone systems, audio/video equipment and home theater systems. Offers 5 minutes battery runtime with a full load of 1000VA and 12 minutes with a half load of 500VA. Supports battery replacement via built-in access panel. 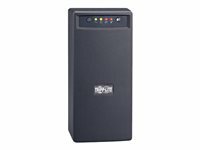 The SMX1000LCD SmartPro 230V 1kVA 500W Line-Interactive UPS provides battery backup and AC power protection against blackouts, brownouts, power surges and line noise that can damage electronics or destroy data. Ideal for backing up home/office workstations, media centers and home entertainment systems, the SMX1000LCD switches to battery mode in milliseconds to keep your connected equipment running long enough to save files and shut down safely with no data loss. Featuring six C13 outlets and a C14 inlet that accepts a user-supplied AC power cord, the SMX1000LCD has an internal battery that provides 11 minutes of support at half load and three minutes at full load. It can also power an entry-level PC up to 60 minutes or a single DVR/VCR component up to three hours. Three of the six outlets provide surge protection only for printers and other non-essential devices. A front-panel LCD screen lets you configure settings and monitor operating data, such as voltage, battery and load statuses. Automatic voltage regulation (AVR) maintains 230V nominal output over an input range of 171V to 266V without using battery power. EMI/RFI noise filtering improves your equipment's performance and prevents damage. A 480-joule surge suppression rating protects your equipment from harmful power surges. With Tripp Lite's free downloadable POWERALERT12 software, the SMX1000LCD enables safe unattended system shutdown and file saves in case of a prolonged power failure. Supports half load up to 11 min. and full load up to 3 min. Powers entry-level PC up to 60 min. and a DVR/VCR component up to 3 hr. The SMX1500LCD SmartPro 230V 1.5kVA 900W Line-Interactive UPS provides battery backup and AC power protection against blackouts, brownouts, power surges and line noise that can damage electronics or destroy data. Ideal for backing up home/office workstations, point-of-sale applications, VoIP systems and small business networks, the SMX1500LCD switches to battery mode in milliseconds to keep your connected equipment running long enough to save files and shut down safely with no data loss. Featuring eight IEC-320-C13 outlets and a C14 inlet that accepts a user-supplied AC power cord, the SMX1500LCD has an internal battery that provides 12 minutes of support at half load and 4.5 minutes at full load. It can also power an entry-level PC up to 60 minutes or a single DVR/VCR component up to three hours. A front-panel LCD screen lets you monitor operating data, such as voltage, battery and overload statuses. Automatic voltage regulation (AVR) maintains 230V nominal output over an input range of 144V to 282V without using battery power. EMI/RFI noise filtering improves your equipment's performance and prevents damage. An 890-joule surge suppression rating protects your equipment from harmful power surges. With Tripp Lite's free downloadable POWERALERT12 software, the SMX1500LCD enables safe unattended system shutdown and file saves in case of a prolonged power failure. C14 inlet accepts user-supplied AC power cord with country specific plug. Supports half load up to 12 min. and full load up to 4.5 min. Tripp Lite's OMNIVSINT1500XL line interactive UPS system offers voltage regulation, surge suppression and long lasting, expandable battery support for personal computers, internetworking equipment and other sensitive electronics. Internal UPS circuits support entry level PC systems for up to 75 minutes during power failures so that connected equipment can be shut down without data loss. Automatic Voltage Regulation (AVR) circuits regulate brownouts as low as 151 and overvoltages up to 282 volts back to usable 230V levels without using battery power. Offers complete desktop power protection in an attractive black tower configuration. Includes 8 IEC320-C13 outlets with battery support and AC surge suppression. USB port enables optional unattended system shutdown without data loss in the case of extended power failure, USB cable included.